Can Arum turn Tim Bradley into a PPV star? 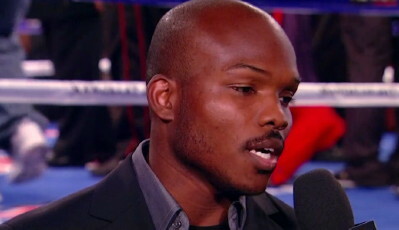 By Dan Ambrose: Bob Arum recently signed WBO light welterweight champion Timothy Bradley (27-0, 11 KO’s) to a contract with his company Top Rank Promotions with the idea of turning Bradley into a pay per view attraction and one of his biggest stars. In attempting to make that happen, Arum is matching Bradley up against 40-year-old former two division world champion Joel Casamayor on November 12th on the undercard of Manny Pacquiao’s fight against Juan Manuel Marquez on PPV. Arum has hinted that Bradley could be next for Pacquiao if things go right. Bradley has to beat Casamayor and look good in doing so. Pacquiao also has to defeat Marquez. If there’s no one else around like Floyd Mayweather Jr. to fight Pacquiao, then Arum will likely match Bradley against Pacquiao. Arum is hoping that by putting Bradley first on Pacquiao’s undercard against the past his best Casamayor in November and then in a fight with Pacquiao, it will turn Bradley into the beginning of a star for Top Rank. I think Arum may find that stardom will be an elusive thing for Bradley, not matter how many times Arum trots Bradley out for his high priced PPV cards. The way I see it, Bradley doesn’t really have an entertaining style of fighting that leads boxing fans to want to watch him fight. Bradley lacks power, size and has a nasty habit of clashing heads with his opponents while coming forward. Part of the reason for that is Bradley’s limited 5’6″ height and lack of arm length. This makes it necessary for Bradley to get in real close before he can land anything. Despite a lack of height, power and size, Bradley has been able to succeed largely because of his hand speed. He’s fast and that enables him to compensate for what he lacks in other areas. However, Bradley won’t have his speed as he ages and he may end up struggling in the near future the same way that Roy Jones Jr. has struggled after he started losing hand speed and reflexes. But I’m not so sure that Arum can turn Bradley into a PPV star by matching him against Pacquiao and putting him on one PPV card after another. You still have to be exciting to watch to interest fans, and there are a lot more interesting fighters to watch than Bradley, even in the same light welterweight division. I think Arum is making a mistake by signing Bradley. He’s obviously going to force feed the boxing public by putting Bradley on all of his big PPV cards in the foreseeable future in hopes of him catching on with boxing fans so that they’ll gladly pay to see Bradley fight in subsequent PPV cards. I just don’t see it. I’ve seen Bradley enough to where I wouldn’t want to pay to see him on PPV. I can’t see that changing by seeing him fight a 40-year-old like Casamayor or fighting Pacquiao and getting beaten up by him. If anything, I’d be even more convinced that I don’t want to see Bradley in the future after watching him fight Casamayor and Pacquiao. Boxing » Joel Casamayor » Can Arum turn Tim Bradley into a PPV star?